I have also included a table of contents including all of the projected content. I hope many of you find this helpful in your work. If you want to look at any of the sources I have referenced, I have copies of most of them that I can send to you. Please contact me at chazzq@udel.edu if you have any comments or suggestions for corrections that you think I can make in updated versions of the chapter. I am particularly interested in any relevant material I am not aware of that you can send me. I hope to have the fourth chapter, on strategy, completed in the next month or two. This next Thursday, Sept. 20th, I will be co-hosting a webinar entitled, The Mindset Science of Playing at the Next Level. It is sponsored by my new venture, Diamond Scouting, Psychometrics. Todd Thomas, Diamond’s Director of Scouting, will be hosting the event. The many benefits of psychometric scouting and player evaluation will be covered. We will explain how quantifying player makeup, mindset, and instincts can easily identify future All-Stars, that could be overlooked or missed altogether. The Webinar is free and I would be honored to have the SABR Statistical Analysis Committee join in and share in the discussion. Please pass the word. I am looking forward to having you and the members join us. Here is the link to register, https://t.co/tj4EOuVT5K. Yesterday Tom Ruane posted a note to the Retrosheet mailing list about his latest research: teams who score the most (or the fewest) runs with a specific number of hits. You can read Tom’s most recent articles here. Tom has been a Retrosheet volunteer and board member for many years, and over the past decade has written dozens of articles on things he has gleaned from Retrosheet data. You can see Tom’s archive here. WARNING: his articles are very addictive. I’ve been researching connections between hitting mechanics and data for a while and wanted to share some surprising findings that I thought you might find interesting. Hitting with backspin has been a popular, “conventional” objective in hitting for some time. 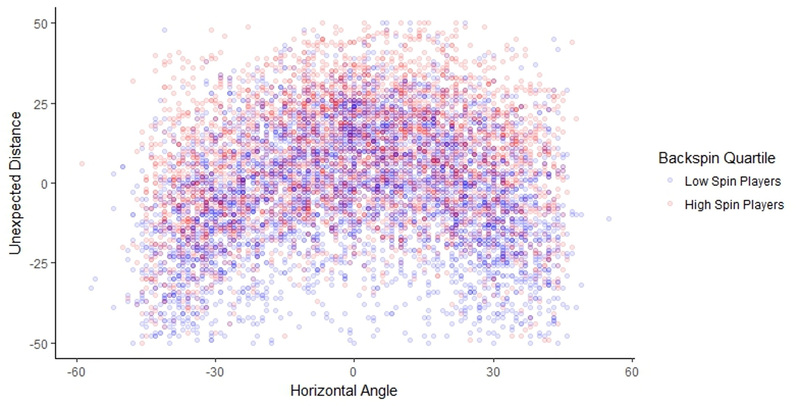 We know from basic physics that a ball hit with backspin travels farther than a ball hit flat or “square.” I developed a model to assess the distance impact from spin based on Statcast data (the method and model are included at the end of this post ). As shown in the table below, high backspin balls result in high BABIP. It is important to note that the data in the following table is based on ball, not player performance (the dataset is balls hit with Exit Velocity >=90MPH and Launch Angle of >=15 degrees). 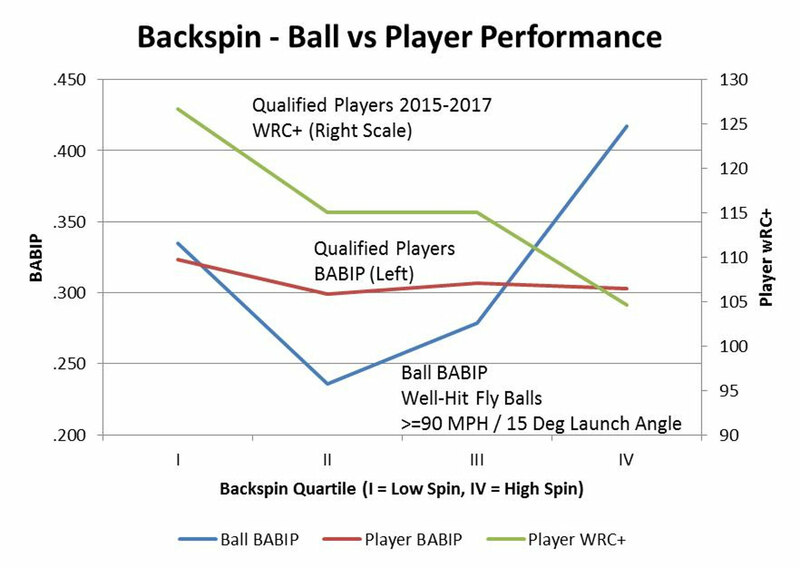 At the player level, however, square-hitting players significantly outperform high backspin players as evidenced by higher levels of BABIP (.324 vs. .300) and wRC+ (129 vs. 105). The following table is based on Qualified Hitters from 2015-2017). Clearly, at the player level, there is a “cost” side of the equation that needs to be considered. Thus, players cannot simply choose to hit only the “good” backspin balls – they must accept the full distribution of results that come along with that strategy. The spin impact can be seen in the following chart of hits for both player groups over the 2015-2017 seasons. The spin impact for both player groups as shown above indicates that there is a spin-type “tendency” at the player level. Additionally, over the examination period, only one player switched groups, confirming that the player/spin relationship is not random. As suggested in the chart above, the horizontal angle of the hit reflects the type of spin (i.e., backspin vs. sidespin) which has a significant influence on distance (see model here for additional detail). Although the R2 between spin and wRC+ is not very high maxing out at .17 (for the Qualified Player dataset), the outliers are quite remarkable. In fact, of all the extremely high performing players (wRC+ >135), none are hitting with high levels of backspin. Similarly, of all the very low performing players (wRC+ <80), none are hitting the ball with low levels of relative spin. The dataset below includes players with at least 200 PAs each year for 2015-2017. I was curious how spin compared to exit velocity as a performance factor. After all, EV is widely considered as one of the best performance related metrics. 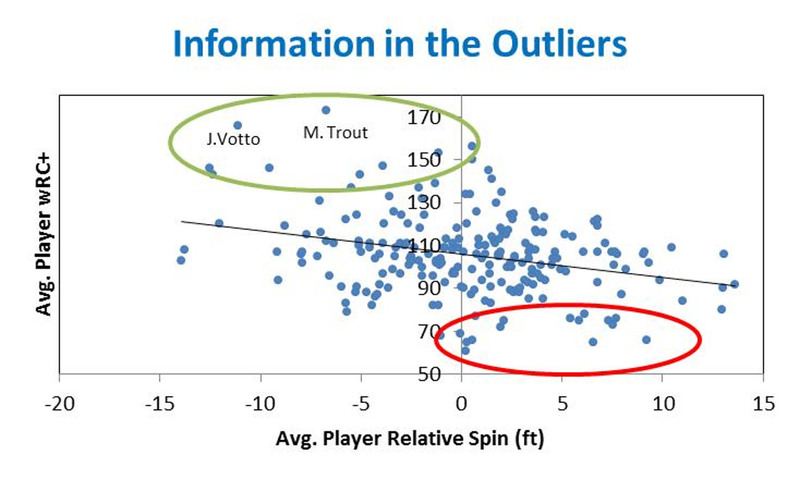 It turns out that spin-related performance for players with high levels of plate appearances (PA) is indeed significant based on an examination of the top and bottom quartiles for both EV and spin (inclusive player membership required for all years from 2015-2017). Not only did players in the top quartile, flat-hitting group outperform the top quartile, high EV hitters given high plate appearances (PAs), the performance difference between the top and bottom quartiles was greater for the square-hitting group. As PAs increase, the “noise” of the short-term outperformance of backspin is essentially extracted, revealing the greater value of a square hitting approach. 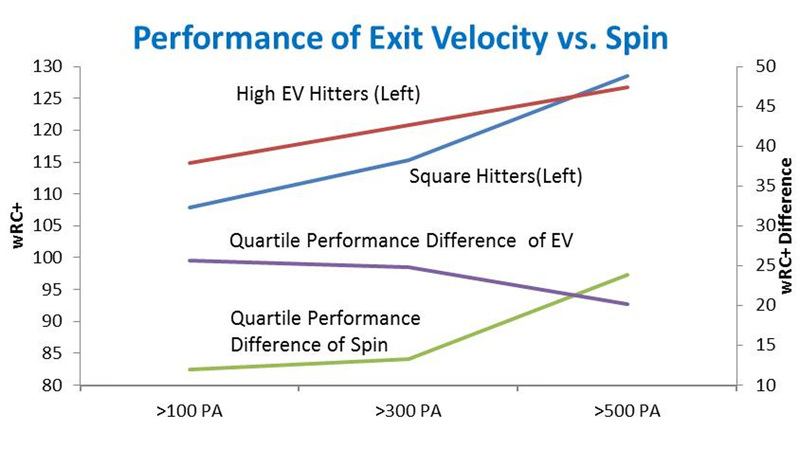 Without question, EV has a strong connection to performance; however, the ability of players to influence EV is limited due to physical size, strength and swing speed; consequently, players likely have more upside by switching from a backspin to “square” approach than attempting to increase EV. I had a hunch that smaller players might be tapping into the backspin-driven distance gains – indeed they are! Whether consciously or subconsciously, players learn that hitting with backspin increases distance. Since the larger players generally have more natural power, they haven’t needed to use backspin to “keep up” with their peers in terms of distance. The data suggests the smaller players may be blinded to the “cost” side of the equation, and are focused more on the extra distance. Maybe human nature in seeing what we want to see? It could also be a selection issue where distance is being incorrectly viewed as “power” for the smaller players and those players are being promoted through the various levels of baseball. Is the typical pre-game batting practice where many players go for home runs causing or contributing to the issue? Ego is a very real issue and the typical batting practice sessions may be unknowingly changing the swing paths of the smaller hitters to generate more backspin. I noticed the other day that Tony Kemp with the Astros (a smaller player) is now avoiding all pre-game, on-field hitting because he doesn’t want to be tempted to “swing for the fences”. Without spin data at lower levels of play, however, it is difficult to know when, in the course of the smaller player’s career, spin is being added. Given that “hit with backspin” has been part of consensus views for some time, this advice is not merely ineffective but it is actually performance-detracting. What’s more, significant improvement may be possible for players who are in the high backspin group and simply reconsider the “truth” of backspin. If there seems to be interest in the topic, I will submit a follow-up post regarding the specific mechanical differences, based on data, of “how” players are hitting the ball square – the findings are equally surprising. Hi everyone – I’ve attached the latest version of my Statistical Baseball Bibliography, along with instructions for using it. I am in the middle of a major revision of it, including a revised classification scheme, and when you see entries in bold that means I’ve not yet had to time to reclassify them. I hope you find this interesting and useful. If any of you need a particular article for your work, let me know and I can probably get it for you. I will have more material to share with you in a few weeks.